Do you have jewelry in need of repair? We have been successfully repairing jewelry for 30 years and have seen a wide variety of pieces from the most basic bead restringing to the most intricate and unique jewelry pieces. Oftentimes, we handle the simplest repairs in the same day. However, more complex repairs may take additional time. Bring in your items and we will provide you with a free estimate. We are confident you will be pleased with our quality repair service. Contact us regarding our services. for all of your special events! 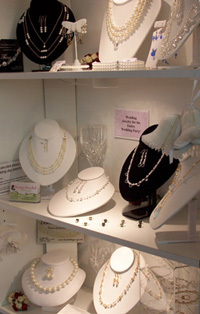 We have been designing and customizing heirloom quality beaded jewelry for customers for decades. If you are planning an upcoming wedding or getting ready to celebrate a birthday, anniversary, or other special event, we are your custom beaded jewelry resource! Contact us to setup an appointment or visit our shop to learn about our custom jewelry making services. Copyright © 2019 Beads �N Things, Pittsford, NY. All Rights Reserved. Reproduction in whole or in part of any material published on this website without the expressed written permission of Beads ��N Things, Pittsford, NY is prohibited.